….well at least his name isn’t The Master Debater. @Loki: The Master Debater’s arch enemy is the Cunning Linguist. 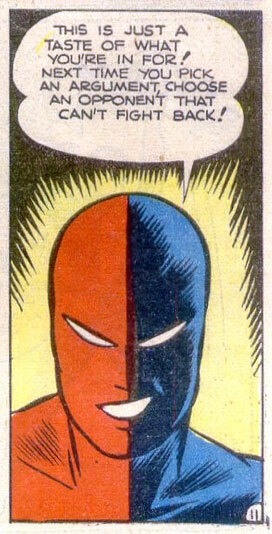 That’s actually the original Daredevil, a 1940’s-era character who was a fighter pilot and super-hero guy. But yeah, he looks a LOT like the later 3-D Man. Alex Ross tried to revive a whole set of these guys (including the now locally famous Green Lama) in Project Superpowers. This one was referred to as ‘Devil. Gee, I wonder why? But in that one, he didn’t talk, if I remember right. Ah, right. I’m glad you mentioned that, Bael, because ever since I read Project Superpowers, it’s been gnawing at the back of my mind: why the hell is a guy without horns or demonic power called ‘Devil? I did a lot of fill-in-the-blank guessing for what that apostraphe might be standing in for, believe you me, but for some reason never thought “Dare”! Duh.